In Past the Shallows, the boys' father is an abalone fisherman off the southern Tasmanian coast. 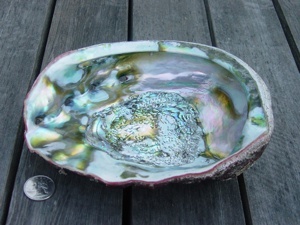 Abalone are gastropodssingle-shelled molluscssimilar to snails, but with a more flattened shell. Other than their size and respiratory poreslarge holes near the edgetheir outer shell is often unremarkable. However, their inner iridescent appearance is prized by collectors and used for mother-of-pearl jewelry. Primarily, abalone are hunted and sold as a culinary delicacy. 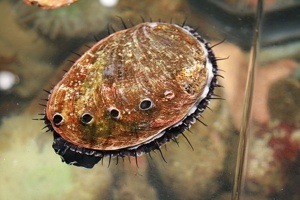 Although abalone farms also provide demanding consumers with these tasty molluscs, wild abalone are more highly valued. In Australia, the largest abalone producing country in the world, there are two types: blacklip and the more valuable greenlip. China is the largest importer of Australian abalone and an increase in demand has led to greater profits and therefore greater risks have been taken to procure them. To look at an abalone, it is difficult to imagine any danger associated with fishing for them. It's not like they could attack a diver. Their only protection is their large strong shell and a powerful "foot" muscle that enables them to cling tightly to rocks. And yet, diving for abalone can be an extremely dangerous endeavor; especially in southern Australia where Past the Shallows takes place. The actual process of gathering abalone is somewhat simple. Recreational fishermen collecting abalone for personal consumption can often reach them by wading. The goal is to avoid churning the water excessively so the abalone do not clamp even more tightly to the rocks. After ensuring the abalone are big enough to be legally collected, a flat pry bar is rapidly slipped beneath the strong foot muscle, removing the abalone from the rock, and placing it in the collection bag. It is important not to cut the abalone muscle as the bleeding will be difficult to stop and will result in a dried up withered creature not worth eating. However, for commercial abalone fishermen, it is necessary to dive deep into a perilous environment. As the greatest number of abalone live far below the surface, specialized diving equipment is almost always necessary. Most abalone fishermen spend six to eight hours under water at a time using a breathing tube attached to the boat. Most divers have experienced some kind of trouble with this tube as there are many opportunities for entanglement and equipment failure. Besides the inherent dangers of diving in general, fishermen need to consider universal risks such as strong ocean currents, and rough waters combined with rugged rocks, and sharks. According to Discovery Channel Australia, hosts of the television show, "Abalone Wars," South Australia is home to more sharks per square kilometer than any other part of the world. The most dangerous times in the dive are when descending and returning to the boat, simply because Great White sharks attack from below. In February 2011, Peter Clarkson, an experienced abalone diver was killed when two sharks attacked him under water while his diving partner witnessed the horrific assault. In addition to the potential for financial gain, the adrenaline rush and the ocean's wonders call to these divers, making the risk worth it. As the abalone fisherman says (in the video below), "I guess it's just in me blood." This "beyond the book article" relates to Past the Shallows. It first ran in the May 7, 2014 issue of BookBrowse Recommends.